The developers at LucasArts have produced another outstanding Star Wars with the release of Republic Commando for the Xbox. This tactical shooter places you in command of an elite group of Clone Troopers as you lead them battle through a variety of environments and face an onslaught of enemies. During each mission, you control the actions of your 3 other comrades and perform a variety of operations ranging from combat to explosives detonation and more. The game's excellent visuals, intuitive controls and unique setting set this apart from other titles in the tactical shooting sub-genre. While it becomes a bit predictable and monotonous at points, Republic Commando is a solid title that delivers solidly entertaining action in exciting worlds. Set between the events of Episodes II and III, Star Wars Republic Commando for the Xbox allows you to control an elite squad of Clone Troopers in a variety of locations and planets as you fight against the separatist movement and defend the republic. The four-man squad will face three main groups of foes: the Genosian invaders who are running the Droid Factories on Geonosis, the brutal Trandoshan armies on Kashyyk, who are in the middle of a long-running war against the Wookies, and finally the forces of the Trade Federation, with an army of deadly Battle Droids supplies by the Genosians. Within each mission, the squad will face a variety of enemies who attack your squad in groups. Each group of foes presents its own unique attack patterns and tactics. Some are much easier to defeat than others, while some of the more difficult enemies, such as the Super Battle Droids, can only be taken down using special ammo. 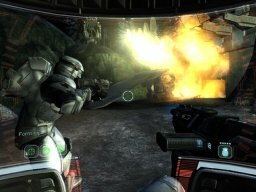 In all, Republic Commando offers more than 14 unique missions with dozens of objectives to complete on each. The game's plot ties in nicely to the events of the films, and gradually builds towards the opening battles in Revenge of the Sith. Players will find a number of locations, creatures and characters from the newly released Episode III in the game. This gives Republic Commando players some interesting hints and teasers for the final prequel since several pivotal characters making cameos. Along the way, the Commandos will need to destroy a number of enemy installations such as power-shield generators and shields, and must complete these objectives before they can move onto the next area. The gameplay itself is fairly linear, which makes the structure very straightforward. As the team's mission begins, players are given a quick briefing, which outlines the objectives for each area in the game. During each mission, players are in constant communication with the other squad mode, who will send messages outlining their progress, tell you about changing objectives and call for assistance if needed. Each Clone Solider under your command is equipped with a variety of weapons including standard blasters, pistols, sniper rifles and thermal grenades, additional ammo rounds can be found on each level as well. Players can also pick up and use fallen foes' weapons against them as well, though these obviously have limited ammo. The player's visor can also enhance vision in dark areas using the low light mode which allows you to see the heat signatures of enemies. During each mission, players act as the commander and can order the other members of their squad to perform a variety of tactics. These include holding position, attacking foes, taking sniper position, placing and detonating explosives and breaching doorways. Republic Commando's control and interface is much easier and simpler than in most other tactical shooters, making it much more accessible for casual players. Players point their reticle targeting system to the location where they want their soldiers to go, and press a single button to implement the action. These include engaging selected targets, securing areas and placing explosives. In certain areas, players will see a holographic image of the soldier performing an action. All you need to do is point the cursor and issue the command using the A button. This system makes controlling your squad much simpler than in other titles. Despite the ease of command, they're also quite responsive and will perform their tasks quickly and efficiently. Most of these actions are simple to perform yourself as well. Placing explosives requires you to hold the A button down for a few seconds, and then move away before you detonate the charge. While it's easy to perform these operations, you are vulnerable to attack when you are doing this, and you need to make sure the area is secure, or you'll be an easy target. In addition to these commands, players will also find a number of useful objects in each area. Scattered around each level, players will find a variety of health stations that they can use to restore their health. 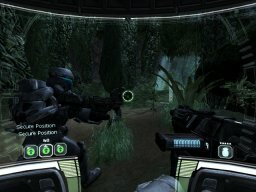 In one of Republic Commando's more unique features, players can use an electrical charge to revive fallen comrades by targeting them and holding down the A button. If the player themselves takes too much damage and dies, they can call on the other squad members to revive them as well. Republic Commando's simple controls and straightforward interface makes the basic operations easy to perform, allowing players to concentrate on the mission at hand without fumbling around for the controls. The gameplay itself is quite challenging and engaging, with a dark somewhat ambiguous tone that makes for an immersive experience. While your squad mates are fairly intelligent, so are the enemy forces you'll encounter. They won't automatically walk into your gunfire, and can take cover behind corners and objects. In addition, their attacks are quite aggressive and they won't hesistate to attack in groups. Unfortunately, there are only a limited number of enemy types in the game, which makes their attack strategies and tactics more predictable than they should be. Knowing what their tactics will be in advance makes the gameplay feel a bit monotonous after awhile. To help compensate for this, the game offers a good balance between all out combat and more strategic objectives, which helps to give Republic Commando more depth and nuance than you'd expect. In addition, the game changes locations and settings at several points, which presents the player with an entirely new set of enemies and challenges. 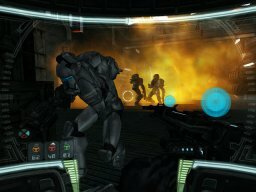 In addition to an excellent single-player mode, Republic Commando offers some solid online play with several modes available on Xbox Live including Deathmatch, Team Deathmatch and Capture the Flag gameplay variations with support for up to 16 players simultaneously. These modes offer highly polished maps and exciting opponents, though the lack of a co-operative mode is somewhat baffling. Still, the fast, lag-free gameplay is quite addictive, making the online component a solid addition to the series. Republic Commando's online are excellent and retain the polish while freeing players from the constraints of the somewhat linear solo mode. The gameplay mechanics are outstanding, but Republic Commando's audio/visual presentation does and excellent job of recreating the epic feel of the films. From chaotic planetary surface battles, to claustrophobic dark corridors, the game's visuals definitely give the game an immediate punch that makes the gameplay feel darker and grittier than most scenes from the trilogies. Republic Commando's visuals are richly detailed with excellent texture mapping, character animation and lighting effects that lend the action a realism and tension that many of the antiseptic Star Wars titles lack. While there isn't as much variety to the enemies as one would like, they're all rendered expertly with unique attack patterns and movements that closely follow their film counterparts. The game uses first-person perspective throughout and this close-quarters combat gives the game an immediacy and urgency that adds tension to the overall presentation. On the audio front, the game excels with great voice acting punctuated by John Williams' brilliant score to create a classic Star Wars vibe that should thrill fans of the series. Republic Commando shows a high-degree of competence aesthetically, with a great deal of production polish that makes this one of the best-looking Star Wars games on Xbox to date. History has proven that making a compelling Star Wars title that actually hews to the conventions and traditions of the films is a difficult task. However, it seems that LucasArts has finally come across a winning formula, with Knights of the Old Republic and Battlefront pleasing players with solid gameplay that doesn't sully the essence of the series' appeal. You can now add Republic Commando to that list. This is a solidly entertaining, well-produced tactical shooter in its own right. The game's simple controls, engaging missions and, straightforward structure make it accessible for newcomers, yet challenging for experienced players. Some of the battles tend to get repetitive, thanks to the predictable enemies, but this is a minor issue mitigated by frequent changes in pace and setting. Overall, this solidly produced title is excellent in most areas and benefits immensely from its connection with the Star Wars universe, making Republic Commando an enjoyable and refreshingly sophisticated game that should appeal to both experienced players and newcomers alike.